Since 2015 there has been a distinctive focus on chaplaincy at General Conventions of Synod. 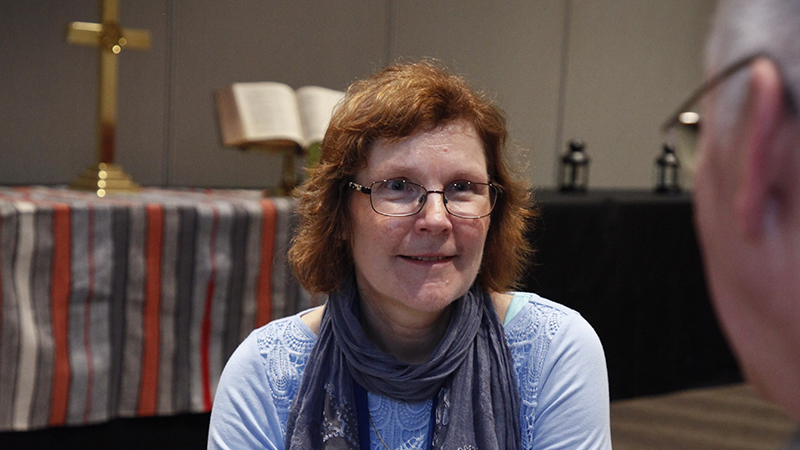 The current convention has benefitted from the work of both ordained chaplains and lay spiritual carers, working in teams across all six days. Leading the Prayer of the Church in morning worship, conducting evening devotions, leading table graces, praying for individuals, groups or into specific situations on request of the chairman – these are some of the more obvious situations where the chaplains and spiritual carers have been at work. But there have been plenty of other instances where they have been invaluable too as the synod has discussed emotive issues and raised questions that may have triggered a need for pastoral care for some people in attendance. ‘During training, Pastor Gordon Wegener highlighted, “This is what the church is, it is who we are as people of the word, care for the soul is what we do”, Pastor Paul Kerber said. The team has worked closely together, also meeting at the end of each day to debrief and pray about what has occurred during the day. They have also had the opportunity to debrief and receive advice themselves from head chaplain Pastor Andrew Brook or Pastor Wegener. Most of the team’s work was done in two locations: the convention chapel and in the business centre. Individual chaplains and spiritual carers were rostered to serve in both areas during their ‘official’ duties. ‘In the chapel we let people sit. We discern if they want to be quiet or whether they want some company’, Angela said. ‘It’s always a team approach. We consider who might be best to go alongside … if they are already known to one of us, for example. We have both men and women in the chapel; we complement each other. ‘On the floor, things are different. We have long times of listening, being observant, scanning the room for signs of physical or spiritual distress. ‘We take referrals from ushers or table facilitators and other delegates who see people showing signs that they need someone to talk to. ‘We have also been observing in the visitors room’, she said. Anyone attending the convention has been able to speak to a chaplain or spiritual carer if they have had need. ‘Since the introduction of dedicated chaplains and spiritual carers we have noted change’, Pastor Paul Kerber said. ‘Chaplains have picked up a change in the way people are relating to each other. At past conventions people had a tendency to fire off at each other, but in the last two conventions this has happened less and less. ‘We have been able to say, “This is about how we see each other in Christ”, through daily worship with holy communion and the conversations between delegates at tables. ‘Convention is becoming a place to stop, reflect, confess and forgive each other’, he said.